Mauricio Calderon, MD, leader in comprehensive Ebola-survivor care with Ebola survivor Ian Crozier, MD, and Emory team members Jessica Shantha, MD, Steven Yeh, MD and Brent Hayek, MD. This summer, experts from the Emory Eye Center reached out to the West Coast of Africa to address an eye condition that was recently discovered at Emory. 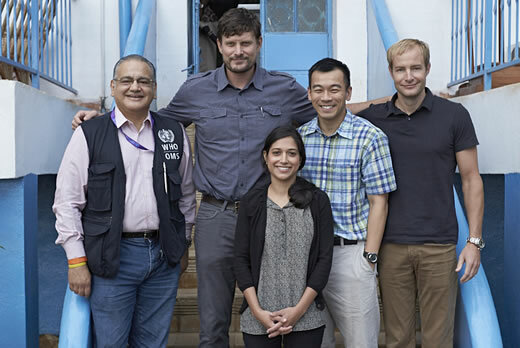 Uveitis specialist Steven Yeh, MD, graduate resident Jessica Shantha, oculoplastics specialist Brent Hayek, MD, and Ian Crozier, MD, an infectious disease physician and Ebola survivor, travelled to Sierra Leone, to assist in the evaluation and treatment of ocular complications in Ebola virus disease survivors. An earlier trip to Monrovia, Liberia was the first outreach to this affected region. Crozier was successfully treated for Ebola and the Ebola related uveitis that developed after recovery at Emory. Surprisingly, live Ebola virus was found in his eye after his full recovery from Ebola. Yeh treated him with a combination of corticosteroids plus an experimental antiviral drug in collaboration with the Serious Communicable Diseases Unit at Emory University Hospital. Following near collapse of the eye, Crozier’s symptoms slowly abated, and his vision gradually improved. As a result of treating Crozier, Yeh and Shantha were motivated to take this new-found knowledge to the many Ebola survivors in West Africa. In April 2015, Quiet Eye West Africa (QEWA) project team from the Emory Eye Center (Yeh, Shantha, Hayek, and Crozier) was invited to join physician John Fankhauser, who was treating Ebola survivors in Monrovia, Liberia. He, like Ebola survivors Kent Brantly and Nancy Writebol, worked at the SIM (Serving in Mission) hospital, ELWA (Eternal Love Winning Africa), during the height of the Ebola epidemic during the summer of 2014. Fankhauser was seeing Ebola survivors and soon recognized that many patients were complaining of ocular symptoms. The team assembled supplies and medications through funding from SIM and donations of medications from Alcon to set up a mobile eye clinic at the ELWA hospital for screening and treating nearly 100 Ebola survivors and for training physicians and mid-level providers in screening for ophthalmic complications. Since this trip, the team has been involved with organizing Ebola survivor eye care with West African health care providers and many organizations including the World Health Organization (WHO), Partners in Health (PIH), Helen Keller International, and Medicens sans Frontieres (MSF). While preparing and undertaking the efforts at ELWA Hospital in Liberia, the QEWA team also remained actively involved with the organization of eye care with many partners on the ground in Sierra Leone. They traveled to Freetown from July 14-23 in partnership with the WHO, PIH, and local ophthalmologists with the Ministry of Health and Sanitation in Sierra Leone. They visited multiple eye clinics in Freetown and Port Loko, and set up a mobile eye clinic. In addition to providing assistance with patient care, the Emory/QEWA team built capacity through education and training during the evaluation of Ebola survivors, and also organized a didactic symposium summarizing eye disease and uveitis management in Ebola survivors at the Lowell and Ruth Gess Eye Hospital in Freetown. As many unanswered questions still exist both related to the causes of eye disease and management strategies, Yeh and the team continue to be actively involved with ongoing efforts in West Africa. They have named their efforts, “Quiet Eye West Africa.” The name refers to the “quiet” or non-inflamed, healthy state of the eye following recovery from uveitis, the inflammatory condition that Ebola survivors can experience. In the “quiet eye” phase, the eye is calm and white, whereas in active uveitis the eye shows intraocular inflammation with eye redness and significant pain. “Just as Dr. Crozier’s eye was able to return to its “quiet” state after a period of acute, critical ocular illness, the ongoing goal of the QEWA project team is to ensure this care can be offered to the many Ebola survivors in West Africa,” says Yeh. Emory Eye Center has a mission to conduct pioneering research into blinding eye diseases, to educate and train eye professionals, and to provide excellent patient care. The Department includes 33 ophthalmologists, eight optometrists, 11 basic scientists, 11 post-doctoral fellows, and nine researchers in other Emory departments who hold joint appointments in the Emory University School of medicine’s Department of Ophthalmology. Ophthalmology research is supported by current funding of $8.8 million. The Department remains in the top rankings by U.S. News & World Report for the 17 years the magazine has held a ranking for Ophthalmology. It also ranks in the Top Ten in the peer-reviewed Ophthalmology Times annual report.